Well it is finally here.. We have reached the date of the above green time cycle. This cycle marks the date of significant highs, normanly followed by a sharp break down. This cycle has remained acurate for last 3 years (we are entering 4 year) and it remain spot on. 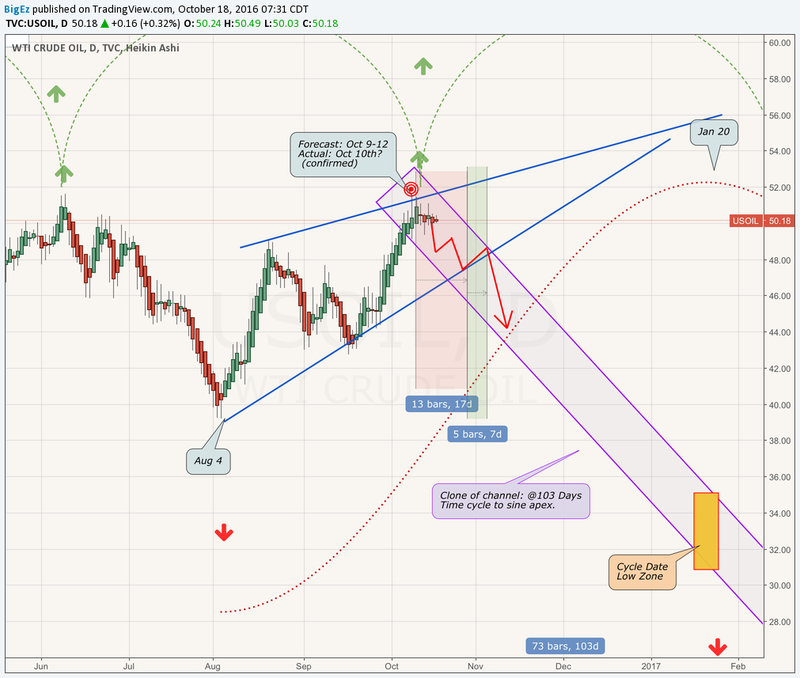 The Green time cycle shows the dates when oil stops a bull run. Even in a bear market, there will be bull run leading into this date... On this date we see the high. Even thought I only use this to predict the Week of the event (break to bearish ).. It has been acurate to the DAY the last three years. As it predicted the break happened on Friday. October 7th. That is six complete cycles going back over three years. Simply put, we have reached the top of the wave until Apex of Red cycle, Jan 20, 2017. Oil is going down. The Red sine wave shows at what point in the cycle oil will be at its low. Think of it as the inverse of the Green time cycle with a different wave timing. The low for oil will be on the Apex date of the Red sine wave . The last apex occurred (and was predicted) on Aug 4. This wave timing longer than the Green time cycle, so you can see it's apex can occur from days to months after the High of the Green time cycle. The difference in time between the two dictates the speed of the fall. This pattern is consistent. Sure... I only make a handful of trades a year, and i normally swing them for about 3months, so why is this important to short term traders.. Because if you know the direction for the next few weeks or months, and you know any spike up before the Red sine wave date will be reversed to at least the prior low since the Green time cycle date. You also know we made the trip from 40'ish to above 47 twice and our longterm shorts are still underwater. You also know that we also swung short-term shorts for +21% profits with a 1week trade. Neither of these cycles predict price, just course and direction. Our target remains 38 WTI by Jan. 20, 2017. No do overs, not yea buts.. We feel oil will bottom on this day for cycle, and although it will take a few days to confirm a top, and could test 50 this week, we feel this marks the end of this last bull run of the year. Trade active: So I looked at last cycle and the size and speed of it's price range during the descent. I also look at average days price decline and increase/consolidation.. this is actually pretty close to what we did list year, just more exact. It shows during the last sine cycle, we had and average of about a two weeks decline followed by an increase/consolidation for about a week. This accelerated halfway through the cycle, and slowed as it bottomed. Sorry this chart is getting too busy.. but includes some projections based on last cycle. Thanks for all PM & likes.. So this is what I'm calling for the next three weeks. Please don't trade on this if you do not completely understand my timing cycles. There will be plenty of opportunity using tried and true charting options to make money both bull/bear. With multiple >5% days ahead, daytraders should stick to their methods not mine! It is also important to note the biggest range can be the first few days. I was very happy to see Fridays action, as i say Spooky as to timing.... But on a short term, please consider these cautions. I base this on a range of a few days, not hours or even 1 day. (the average is 2-3days). The cycle date was Oct 9th, but that feel on a Sunday. Even though it broke on Friday as expected, its not unusual for it to take a few days.. In fact likely. We are prepared to Short more as soon as i feel break is over. We could see a spike to 52 even, as the cycle doesn't predict price, just range and timing. There is no need for me to short 51.50 on the way up, if that happens. As I've said over and over.... These cycle transitions are violent more often than not. Be safe. Trade active: Sorry, I meant to add it in days. Trade active: We just added to our shorts we have a wide stop, manual for now but at 52.25. I'll feel better once we are closed under 50. Be safe.. Comment: Start of a new study. Using 3year as base with spread overlay. Looking for spread indications on direction within cycle. Comment: Sorry.. Wrong link, but that is a good read. Comment: Hard to see this as anything else than confermation. Comment: On Holiday today... No changes except im going to use Heikin Ashi as it helps cut some noise. We are way comitted here.. So no stops below 52 and goal remains 38 by Jan 20. If you on this trade you will be taken out with Stop Loss targets too tight. Expect 5% range days.. Be safe, will update Sunday whin im back in the hood. Comment: Updated clone channel , added a target zone... based on cycle date and channel. Comment: No change in strategy. I was hoping to add more shorts near our last lots of 50.89, but only if it broke up yet failed to breach the multi year trends resently set on the cycle date. In other words, if it tries and fails to breakout. Otherwise we will wait for opertunity closer to or after EIA report. Comment: No change on time cycle. Interesting.. most range consolidations last an avg of 5 days (8max) in daily Heiken, followed by 4 or more days of clear direction. We are on day 5 today.. With report tomorrow, im betting we are coiling for the break... Down please :). Comment: Away for much of the day, to return to this... did you panic? If you did, you need to follow anouther trade, this isn't for you. Otherwise, it looks par for the course.. expect a few 5% days, maybe starting tomorrow. This trade is about timing a bottom from a cycle high. Tight stops will get killed here. This may be the heigh for year. Comment: Good day in the end.. Keeps going stop hunting. Hopefully today will set the trend for the next few.. But expect big swings. We are still short... Just watched today. Ok, so big picture update... Here is what i see on the cycle. So far.. Everything remains on tract. It's looking like yesterdays selloff is holding. We are due for a 3-5% day.. I hoping for a break down obviously, not just for the short, but to also widen the cycle channel. A 3% break up will not void the cycle, but for obvious reasons i want down. Historically, a multi day up cycle is more violent, than the down cycle within the channel, once defined. Fireworks really start under 45. Tight stops will be hunted down.. Good luck, trade safe. We are still all short and following the cycle. Comment: No change, just enjoying ride... if you are still onboard, we are not looking for to do any trades till south of 47. Our stop is near 52, but it's manual. Looks to be fine in channel, but I would like it to get away from this 50 range, before it's next snap back. I'm a little worried the snap back will be on Friday. This is a key day in economic cycle. A hard break down is preferred... but something like a real war, or a big problem in election could make it pop. In either case I expect this week to be a little crazy.. Comment: Yea.. spooky right? How appropriate near Halloween..
Everything looks on track.. almost to a fault. I still expect big swings in the next few weeks, but the trend should remain down until Jan 20th' ish. Once we close in the 48.75 range will may add more shorts on violent bull snap backs. Basically sell strength on violent days.. 3-5% range days. Remember.. last few cycles produced very high ranges as we entered this phase. Good luck, trade safe.. we remain all shorts. Quick update... yes we are still Short. I have updated this (intraday) this is a key level. I moved the cloned bear timeline by 5 days, as the first bear time cycle should end on a pop. That will help set future timeline productions..
be safe.. trade safe. Target remains 38 by Jan 20th. Quick Heiken update.. we will get a SnapBack.. the first one will anchor timezones.. and it is due. Could be tomorrow? But I expect no later than Friday. Counting on clone channel more than timeline until first SnapBack.. be safe.. tight stops are dangerous right now, 3-4% range days will be more often. Comment: Lots of panic, lots of hedging ... as someone in the oil chat said yesterday.. a perfect storm. With the early news that SA has thrown a fit at meeting and has threatened to pump more... I don't see today as a good bet on the coming SnapBack. With the election on Tuesday I also see 'less" of a chance the shorts with close or get squeezed out before weekend. I think many will feel safe or greedy enough to hold shorts till Monday. But I would be crazy to predict what happens Tuesday or Wed... regardless who wins. In either case, it will be a crazy few days.. be safe... regardless of everything else, a retrace is due. Here is a updated big picture.. or as my wife calls it "dangerous mind"
Some updates.. I continue to adjust bear time box right until we get our first up day, but as I say, we are due. I do worry how the election could distort the cycle, but so far I don't see any good/bad news effecting cycle. I have also adjusted clone channel to account for increase velocity, but like the above adjusted bear time box, this will only be confirmed or defined after the first SnapBack retrace of 4-5%. .. again, due! This now puts the low target in Jan below the 38 we have be using. Because the clone channel is not confirmed.. I am not changing out target of 38. This will slow in velocity I think.. If the election is going to have an effect, then it would be after Tuesday night... so if anything, we could see people just hedging on Tuesday. Or we could see a big squeeze if it looks like Hillary will win.. in either case I don't thing a big drop is going to happen before some real up volatility happens. Our shorts remain open.. we might hedge with some UWTI on Monday or Tuesday... depends on the price action... will update if that happens. Good luck be safe.. Okay.. lots of worry, not a lot of action.. as of now, this is what I'm thinking. Call it my safe place. Good luck .. be safe. We are due for a SnapBack regardless of elections.. 25% hedge will let assume this is it. Be safe..
Today looked like a lot of stop hunting... and some dragging up by S&P. 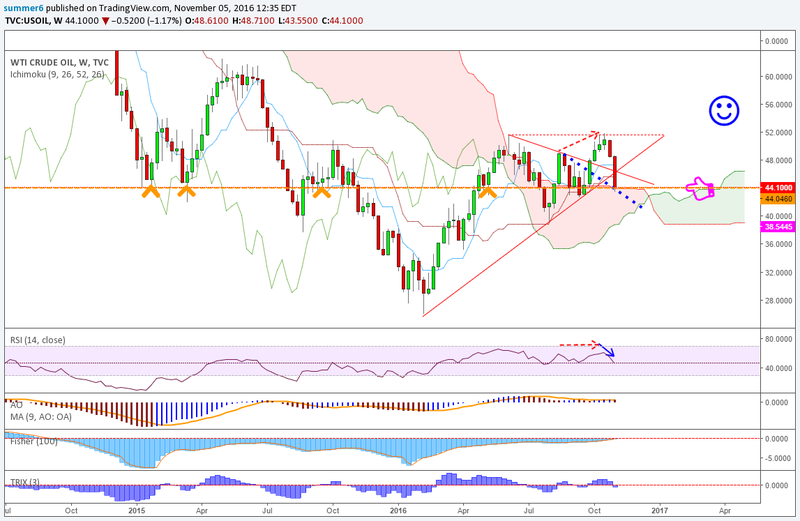 Heiki still shows down momentum.. but much less than last few days. I saw some statistics on TV last night, chart said bear, but Analyst showed that after 6 days of down, historically oil was 3-5% higher, 5 days later... plus our chart says we are due. Comment: Here is our snapback box.. we will close the 25% long hedge if when we leave the yellow filled zone. Yellow outlined represents predicted range during snapback.. Okay, no changes in positions.. this bull is really good so far in the cycle. I just don't want it going to much over 46.38 fib. 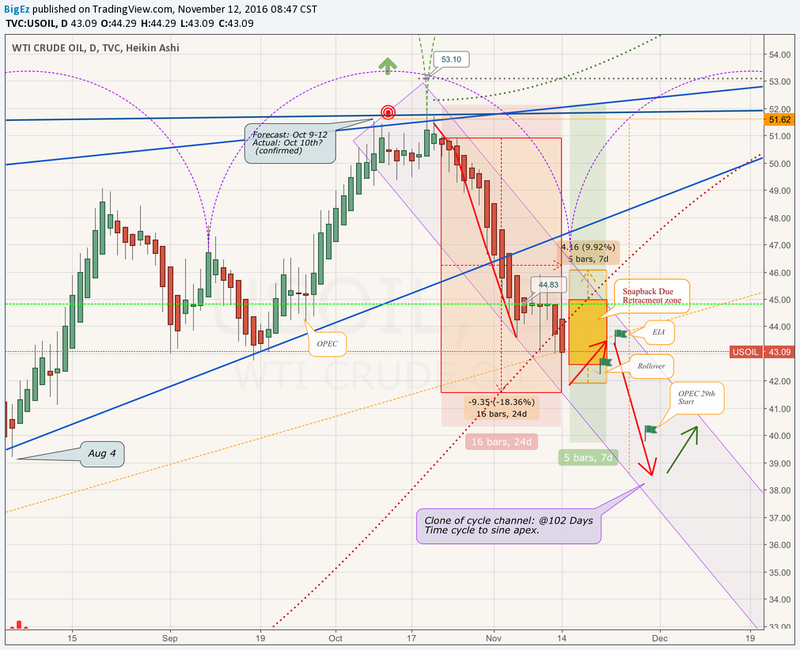 I would like to close the UWTI hedge around 46.5 and for oil to start the next bear timeline. If it can get there on Friday, that would be perfect.. we need a few up days. 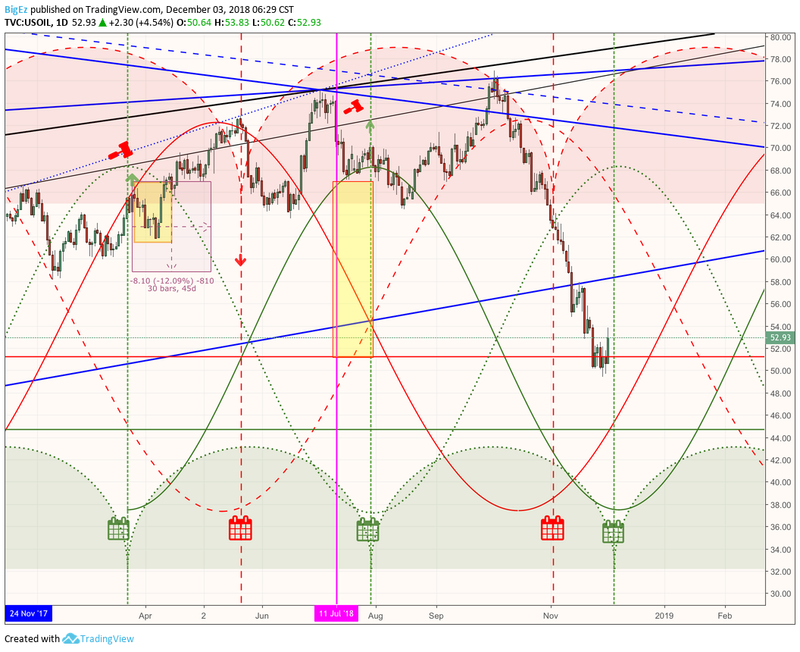 I also added a date line at Nov. 25 (2017.90) this the the top of the last high in this "Economic Cycle"... if you follow Martin Armstrong's cycles. I do. You should check it out. Born 241 years ago... November 10, 1775 in a Philadelphia Tavern..
Before our first President .. and before we became the USA. Comment: Sorry.. left this off above summary..
All positions are same. Made change in bull tinezone. It still has till Friday to get it done...( avg retrace 7% over 6 days..) which is next week. Up to 46.70 would be good for my Hedges. We are in the green on our UWTI hedge, but around 46.60'ish would be a good pivot to new bear timebox. Some trend thoughts... Did the (less than 2hr Trump Dump) change the longterm trend lines, or should it be discontented ? In one case, the trump dump low helped confirm zero Fib support, but current resistance is reacting at old (dump discounted) levels.. which one you use could make a big difference.. Still looking for a short lived bull... no change in positions. Big Short. Updated..I don't think the Trump hump was the pullback that's due. 42.81 is Sept low res. I would like to see one more down day to under 42.50, then snapback & squeeze going into rollover & EIA. A mini "bull day" TS is due Tuesday as well. So we'll see. Good luck. Otherwise all our shorts are still open. Be safe, will update on trade. Comment: Just sold our 25% UWTI.. Trump Hedge ... . We are at Top of channel and at same retracment point as prior cycles .. we are now back to 100% short. Comment: Quick note.. still 100% short. Crying about missing the hedge. Anyway, all good .. just very bad range. So many hedges for Trump.. all in this range. Plus rollover, OPEC, friggn full moon... all is good, but we will be adding to our "spring longs" in the 43 range... packing for a trip, next stop Piccadilly circus.., then over to Deutschland for some good driving. Be safe. Trade closed manually: Well it's not what I wanted for the end and we are not at bottom, imho.... but it was a good run from 51.80 .. Just closed all my DWTI for a nice harvest I'm still a Bear, till late Jan, but not sure I'd have anouther good chance to get out before the delist... it looks to have a bounce coming on this 5 month channel rim. Plus I'm in route back to Houston from EU. Don't want open shorts with no Stops for the 14 hours I'll be off the grid at these levels . Trade active: Adding shorts. Cycle last wave? Comment: Has been a long time since this was updated. WTI should see a sessional peak between today And next Friday. I see Nov 3rd as latest date for peak followed by a fall of 20% in November December. Somewhere near 43. Yes 43..
at least that is what it looks like. Will see soon... good luck. This weekend I will start new study on this this one is getting too long.. and it’s old. Comment: Help visualize 20% seasonal drop. Time to short again? Or is the pullback not over yet? Not sure I would open a new short .. but I swing, over weeks and months. On a shorter timeframe.. if this "plan" is right.. we should see a drop back to in about next week. According to plan... we will see. Not sure how holiday will effect? thanks for updating :) gonna watch the price action. thank you so much for checking my gold chart :) i also posted Silver chart in silver chat. lol more than happy to hear from you again. Been following your chart since you posted it. Spot on. Perfect! Thanks... Yes, I saw that.. Goldman said oil would close year near 45 but visit 27 first, a few months ago just before last OPEC meeting. You never know what will be the trigger for direction, except you can look back and see that seasonally these same type of news stories always happen in 3rd Qtr. It's so hard to filter real news from noise.. and noise moves prices more often. Real news sets trends.. good luck ! standar wave + business cycle?